4. Limited Liability Partnerships (LLP): This type of business is started by two or more people who file a statement of registration with whatever state the business is started in. Also, each partner should sign one agreement that governs the way the business runs. LLPs provide liability protection for both the general and the limited partners.5. Limited Liability Companies (LLC): This type of business is formed by one or more persons filing articles of organization with the state. LLCs have few required legal formalities. 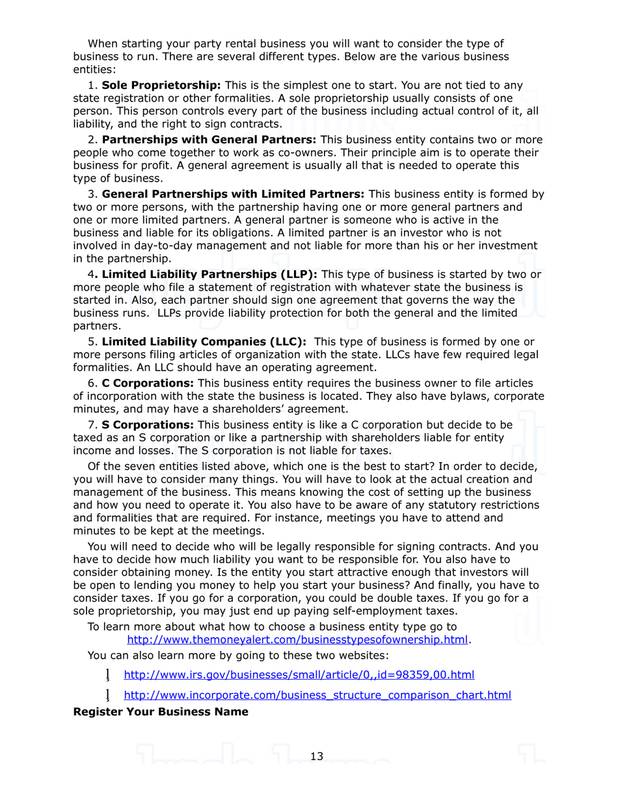 An LLC should have an operating agreement.6. C Corporations: This business entity requires the business owner to file articles of incorporation with the state the business is located. They also have bylaws, corporate minutes, and may have a shareholders’ agreement.7. S Corporations: This business entity is like a C corporation but decide to be taxed as an S corporation or like a partnership with shareholders liable for entity income and losses. The S corporation is not liable for taxes.Of the seven entities listed above, which one is the best to start? In order to decide, you will have to consider many things. You will have to look at the actual creation and management of the business. This means knowing the cost of setting up the business and how you need to operate it. You also have to be aware of any statutory restrictions and formalities that are required. For instance, meetings you have to attend and minutes to be kept at the meetings. You will need to decide who will be legally responsible for signing contracts. And you have to decide how much liability you want to be responsible for. You also have to consider obtaining money. Is the entity you start attractive enough that investors will be open to lending you money to help you start your business? And finally, you have to consider taxes. If you go for a corporation, you could be double taxes. If you go for a sole proprietorship, you may just end up paying self-employment taxes. To learn more about what how to choose a business entity type go to http://www.themoneyalert.com/businesstypesofownership.html. You can also learn more by going to these two websites:• http://www.irs.gov/businesses/small/article/0,,id=98359,00.html • http://www.incorporate.com/business_structure_comparison_chart.htmlRegister Your Business NameOnce you have come up with your business name and decided the structure of it, you will now need to register your business. This is when you will have to go to your local city or town hall. You may have to register your business name with the state in which you live. Here is a list of each state and who to contact: http://biztaxlaw.about.com/od/statelawsandagencies/a/soswebsites.htm.This is only if you are filing as a sole proprietor or partnership. If you are filing as a LLC or corporation, you do not need to register your business name. This is because when you set up your LLC or corporation, this process includes your business name registration.